What do you have to do to maximize Hyundai's momentum? Scott Fink: At the dealership level, it's almost like a prize fight -- if you feel like you have your opponent wobbling, you don't lay back; you just keep hammering until he goes down. After opening Hyundai of New Port Richey near Tampa, Fla., in the summer of 2003, CEO Scott Fink has built his store into the highest-volume Hyundai dealership in Florida and the brand's No. 3 retailer in the country. This year, sales at the store are up 27 percent to 2,997 vehicles through August. Fink, 49, also owns a second Hyundai store and a Mazda dealership about 30 miles east in Wesley Chapel, Fla. Today, there are about 27,000 Hyundai owners in New Port Richey, compared with 141 when Fink opened his store in 2003. Like many dealers, Fink hunkered down by cutting costs and finding ways to be more efficient during the downturn. After outperforming the market for the past two years, he says he's in the market for acquisitions -- but he doesn't want to get so big that he can't have a hands-on impact on his dealerships. Fink, who also is chairman of the Hyundai National Dealer Council, spoke with Staff Reporter Ryan Beene. I'm a native New Yorker, and I was working in New Jersey with Ford Motor Co. I was doing well in the Lincoln Mercury division, but I realized my long-term career was not going to be on the wholesale side. I did not want to relocate to Michigan, and that was the next move for me. And I didn't think I could keep my mouth shut to be on the factory side. A dealer in Queens was looking for a sweat-equity guy to expand his opportunities, so he and I partnered on a deal to buy a failing Mitsubishi store in Clearwater, Fla. I got the franchise in the middle of '89, and in 1996 my partner and I bought a Toyota store on the adjacent property. Soon after the transaction closed with the Toyota store, the wave of consolidation came through. In the latter part of 1998, we sold the businesses to Sonic and the real estate to a real estate investment trust. I stayed on and operated the businesses until January of 2000. At that point I left and did some other automotive-related stuff. I started a chain of collision centers with a partner, which I still own today, and was looking for something else to do. In 2001 I heard from a friend that Hyundai was looking to put a point in New Port Richey, Fla. I was kind of late in the game, but I sent a letter to Hyundai and got my name on the list. I interviewed with Hyundai and met with the regional reps, and I thought I did fairly well. But I recognized right there that there were about a dozen dealers looking for this point, and frankly, I didn't think I had a shot. I knew I was competing against guys that were very well-established and very well-capitalized. When did you open your first Hyundai store, and what did it look like at the time? The units in operation when we opened in June of 2003 totaled 141 Hyundais in the marketplace [of New Port Richey, Fla.]. We recognized that we were going to have a daunting task when we opened up the doors. The planning volume when we first started here was 47 units per month. We had a 4-acre site; I had just built a 20,000-square-foot building. But my goal that I expressed to the team was that we were going to go out and build a loyal following. We were going to build an army of loyal customers that were going to move this franchise and this brand forward. I told them that I'm going to take $1 million and I'm going to put it in the bank, and I want you to go out every day and buy business. What that means is we're not going to let individual profit-loss transactions inhibit us from selling a car. I use this kind of tongue-in-cheek, but your average dealer might say, "I have to be making X profit per vehicle." We don't do that. We want to build an owner base. If I'm $200 to $500 away from making a deal with you, I'm going to give you the money to make that deal. Essentially, I'm discounting the car deeper, more; I'm going to put more in your trade, I don't really care. I want you to become a Hyundai owner, and I want you to become a happy, vocal advocate of the brand and of the dealership. What I explained to my staff, I put a million in the bank and I said, "Don't worry about it, guys." We wanted to be a lynchpin dealer. What did you learn working for a publicly traded dealer group that you brought into your own business? What did you learn not to do? What I learned working for Sonic -- and they were still at the infancy stages at the time -- was I saw that they were going to put good, solid benchmarks, processes and procedures in place that I think long term would benefit a public entity or a large group. What I also saw was that the stores tend to lose personality because they become very corporate-driven. And I will tell you that there's a lot of value that has a true community feel, and I recognized early on that I was losing that. I understand why, but it was taking my personality away from the business, and I didn't like that. I had a three-year contract, and I didn't even make it three years. Hyundai has been an industry darling for about two years. What is behind that success? What's behind Hyundai's success is product. Fortunately, I serve as chairman and president of Hyundai's National Dealer Council and have for a couple of years, and what I will tell you is it's all about product. If you have a weak product and have to rely upon very creative marketing, it will take you only so far. But if you've got great product, which Hyundai has; and you've got creative, out-of-the-box-type marketing, you've got a combination for true success. The Hyundai Assurance plan. Hyundai's continual, aggressive marketing nature. Their philosophy of going big in big places -- the Academy Awards, the Super Bowl, funding the dealers to be able to participate aggressively at the HDAA [Hyundai Dealer Advertising Association] level has made a really big difference. We see the headlines about Hyundai's current sales momentum. What's it like on the local level? I belong to a local country club -- I go to the gym, I don't play golf. When I first got the brand, people would say oh, you're a Hyundai dealer, OK. They didn't talk to me about the cars. Now, I'm not lying to you, everybody wants to talk to me about the cars. I can't begin to tell you how many cars I sell on a weekly basis -- people are standing in line to talk to me. That all has to do with the perception and the acceptance of the brand, and that has changed light-years over the last 36 months. What's crazy is that I know from looking at the statistics that we still trail Honda and Toyota by light-years in terms of acceptance, but it improves every day. If it continues to improve, Hyundai's impact in the United States can be gigantic. How do you approach winning conquest customers? We're riding the coattails of Hyundai's product acceptance, and each and every day, more and more people are interested in the product. Our position is, you've just got to come and look at Hyundai. The Sonata is the No. 1-selling mid-sized sedan in our market. It kind of goes back to our initial philosophy. If you're here, and you're a Toyota owner and have been a Toyota owner, we're going to go out of our way financially to get you out of that car. Your store is across the street from a big Toyota store. Explain the dynamics of competing with a much bigger brand in a big store right across the street. When we first got started here, we absolutely attacked Toyota. We went on cable -- we didn't have gigantic budgets -- and we did creative, funny spots that took place inside [a mock-up] Toyota dealership. All the spots focused on them looking at this new Hyundai store and recognizing that they were losing business. We had one spot, I remember specifically, where a woman walked into the dealership and the salesperson asked, "You're here to buy a Toyota?" And she said: "No, I'm here to buy a Hyundai, but there's nowhere to park over there. I was wondering if I could just park over here." Initially, the Toyota dealer thought it was funny -- kind of got pissed off but thought it was kind of funny, that here's this startup doing this. They don't have a shot. They recognized that the market is a value-driven market, we were pushing the value-driven marketing message, we were going to buy this business, and we were going to take this value-driven market share. Well, slowly but surely, we did, to the point that by last month we outsold the Toyota store. Has customer traffic increased because of the Toyota recalls? We didn't necessarily see people coming in with their keys in their hands. What I think we have seen is we have seen more customers coming in with an open mind to other brands because of the recall. When you found consumers who were very loyal to Toyota, the recalls and all the negative press have given them the right, mentally, to go take a look around. I think we've been an absolute beneficiary of that. How tough is it for your customers to access credit? We've seen it improve. It's certainly not like it was in terms of the subprime sector. But subprime only accounted for about 10 percent of our business. We have seen a dramatic shift in the ability to get our consumers credit because of our relationship with Hyundai Motor Finance. About a year ago, we made a conscious decision to feed 100 percent of our business to Hyundai Motor Finance. It has really made a difference in our ability to put cars on the street. 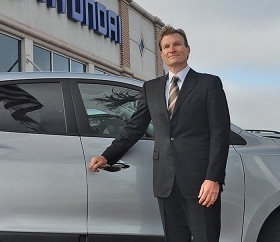 Is the Hyundai Assurance campaign still bringing customers into the showroom? I don't know if it's necessarily bringing people into the showroom. People are still aware of it. It just adds more credibility to the brand and to the product. Some analysts and economists see signs of economic recovery in Florida. What do you see? I think in many cases we're looking through rose-colored glasses here. It's really just not that good. We're living in a fantasy land, but the unemployment rate here in my market is north of 12 or 13 percent. Housing is still an issue, and until we can put more people back to work and we see a true correction in the real estate market, I think Florida will continue to struggle. Although we're selling a lot of cars in our market and our market share is at an all-time high and my sales are up 40 percent retail, I think what we're seeing is we're continuing to steal share from other dealers and other brands. How did your store perform during the recession? When the recession hit and started to build steam, we, like everybody else, took a look at the way we ran our business. We looked at our staffing and the dollars we were spending, line item by line item, and made pretty significant cuts. We reduced head count and asked the people we kept to do more for the same amount of money. What we found was that we could be more efficient as an operation. And as the industry sank and our sales sank, our sales didn't sink nearly as much as others, so we were able to capture more market share. Then, what really catapulted us was cash for clunkers. Hyundai Motor America really jumped off to a fast start and got the dealers involved early with the program. We took full advantage of that and jumped on cash for clunkers with marketing and advertising and inventory and sold over 530 new cars last August. Are you at a point where you can increase your spending on operations and maybe bring some people back? I think we're fortunate in a sense. Because our volumes are up, I've been able to do that to a degree. We are putting more people back to work. But we're tempering that, because we have seen that we can be as efficient, if not more efficient, with a more streamlined operation. We're trying desperately not to get thick around the waste like most businesses do when things are really good. Do you have any growth plans? Do you plan to add franchises? I am absolutely looking at acquisitions and opportunities, but my long-term goal is not to have a lot of dealerships that underperform. I'd rather have a few dealerships that overperform, so I'm looking for the right opportunities. Are there any brands in particular that you might like to add? I think on the domestic side, I think a Ford store would do well. Chevy would do well. Clearly, if you can get a Toyota operation in the right market, Honda as well, it could do well. I'm open-minded to any one of the big players.